ZombieGoddess Beauty: Beauty Basics - What are all these products for? If you are really new to makeup the mounds of different products may be overwhelming. There are so many different skin toned things, and everyone is talking about contouring, tight lining, and highlighting. There are these things all over Pinterest about what order to apply makeup and how- to photos that don’t make sense. I am not a pro makeup artist. You could say I am a self taught makeup artist. I have been playing with makeup for a few years and I have learned from trial and error, and researching. I am not a beginner anymore but I am not a makeup vet either. I don’t know everything there is to know about makeup but I think I’ve got the basics down. Or at least I know what all the products are for. There are tons of different products. And those products come in different formulas. And most products come in more than one type of package. We have to start somewhere. So let’s start with a list of the basic product names and then go into more detail. So let’s start with face primer. It goes on first, right after face moisturizer, under all the makeup. Face primer is optional. But if you do wear it, it has to go on the face first. Face primer smoothes out the wrinkles and lines in your face and helps make your pores look smaller. It creates a smooth base for your makeup. It also helps the makeup come off easier. Face primer also helps your makeup look like you’ve just done it longer and it helps your makeup stay put in hot weather. What formulations does it come it? Face primer only comes in a cream. It has the same consistency as face moisturizer. Face primer is white/clear or skin colored. What type(s) of packaging does it come it? Face primer typically comes in a squeeze tube, like face moisturizer. Foundation is the first thing that goes over primer. You can apply concealer under foundation but I prefer to apply it over because you never know if your foundation will be enough coverage. Ok I think everyone knows what foundation is for but I’m going to sum it up anyway. Foundation is used to even out skin tone and cover up blemishes. It’s used to cover redness and any discoloration. Foundation comes is many formulas. Liquid, cream, mouse, and powder but we will get to powdered later. Foundation packaging depends on the formula. The cream comes packed in a pot. The mouse comes packed in a pot and in a bottle with a pump. The liquid comes in a bottle, typically glass. Most bottles have a pump or the brand that makes them will sell an attachment for it. And some bottles are just a pour out. There are also cream foundation crayons. There is also an airbrush option which is what it sounds like. A airbrush tube sprays on liquid foundation. It is an expensive option and it’s kind of over-the-top for personal use. Why are there so many different formulas? All the different formulas are supposed to give a different effect. The mouse is meant to give an effect like the airbrush which is meant to look “flawless.” The mouse is also meant to be more matte that liquid foundation. The cream has the effect of the liquid with the texture of moisturizer and is also a bit more matte. And the liquid is what most people prefer is pretty self explanatory. In the end they all make your skin look like its one color. And along as it’s a good product it does what is says. BB Stands for Beauty Balm. BB Cream is “tinted moisturizer.” It usually has SPF in it and is usually advertised to moisturize, prime, conceal, cover, and sun block for the most part. It works just like a foundation. Every one I’ve tried has worked just like foundation and I ending up using concealer and pressed powder with it. Like I said BB cream like a liquid foundation mixed with moisturizer. It’s used to even out skin tone and cover up blemishes. It’s used to cover redness and any discoloration. BB cream only comes in a cream formula. Kind of like a liquid like moisturizer. It’s thicker than liquid foundation but wetter than moisturizer. BB cream comes and a squeeze tube like primer and moisturizer. CC stands for Color Correction. CC Cream is a little but more liquid than BB cream but it essentially the same thing. Like BB cream, CC cream is used to even out skin tone and cover up blemishes. It’s used to cover redness and any discoloration. What formulations does it come in? CC cream is like BB cream. It is a cream formula. What type(s) of packing does it come in? Like BB cream, CC cream comes in a squeeze tube. It Cosmetics puts a pump on the end of theirs. CC cream from high-end brands can also come in a pump bottle like liquid foundation and looks like two or three products twisted together. Concealer can go under or over foundation/BB cream. It can go under the eyes and over any spots that need extra coverage. Concealer is used under the eyes to cover dark circles, and on spots on the face that need extra coverage. Concealer comes in liquid, and creams. What type(s) of packaging does it come in? The liquids come in tubes with different applicators, a plastic tube with a sponge on the end of a wand, a squeeze tube with a brush on the end of the tube, and a squeeze tube with a hole at the end of the tube like some lip glosses. The cream comes in a pot package or crayon. Powder foundation goes on over the wet foundation. It can be used all over your face or on places of the face with too much shine. Powder foundation is used for shine control. And to create a complete matte effect over the whole face. Powder foundation is only a powder but it has different packing types. Pressed/packed powder & loose powder. Powder foundation comes in a pot package. It can come pressed in a pan like eyeshadow or it can come loose in the pot and can come just loose product in the pot or sometimes it comes with a this little sifter thing on top. Bronzer goes in the hollows of the cheeks, around the sides of the forehead, on the jaw line, and on the sides of the nose. It goes on after the foundation/powder foundation. Bronzer is used to add a tan look to the face and to add shadows to the face to make the hollows of you cheeks look deeper and to make your jaw line look sharper to make your face look smaller. It is also used to make your nose look smaller or bigger. Bronzer comes in a packed powder, a loose powder and a cream. The loose and packed powders come in pots like powder foundation and the cream comes pressed in a pot/pan and in a stick/crayon. Blush is used on the apples of the cheeks and personally I also use it for eyeshadow. Blush is meant to add the pink color back to your cheek that is covered by foundation. It is meant to add a rosy glow to the cheeks. Blush comes in pressed & loose powder and cream. Highlighter is used on the tops of the cheek bones to make them look higher, down the bridge of the nose to make it look smaller or bigger, on the middle of the forehead and on the brow bone just under the eyebrow. Highlighter is meant to make your cheek bones look higher, and to make your nose look smaller or bigger or make your forehead look smaller or bigger. It’s also used on the brow bone to make it look higher. Highlighter comes in pressed or loose powder and cream. A lot of people fill in their eyebrows. There are quite are few different products to do it with. A lot of people fill in their eyebrows in where they are too thin. And some people fill them to shape them. Packed powder, a cream gel, and pencil. The packed powder comes in a small palette like thing with two different shades. Some of these come with a shaping gel. The cream gel comes in a pot like cream concealer. And usually comes with a two end brush with an angled liner brush on one end and a spoolie bush on the other. And the pencil usually has a spoolie brush or angled brush on the other end of it. Eyeshadow primer goes over the whole lid and anywhere you are going to apply eyeshadow. Eyeshadow primer/eyeshadow base isn’t necessary but when you do apply it, it goes on first under all eye products. Eyeshadow primer does the same as face primer. It smoothes the lid and helps the shadow stay in place and not crease. It also makes removing shadow and liner easier. Eyeshadow base is the same thing. Eyeshadow primer/base comes in liquid and cream. Eyeshadow primer/base comes in the same packages as concealer. The liquids come in tubes with different applicators, a plastic tube with a sponge on the end of a wand, and a squeeze tube with a hole at the end of the tube like some lip glosses. Everyone knows eyeshadow. It’s that colored powder that goes on your eye lids. But now there are different formulations and you can use shadow as shadow, liner, blush, highlighter, and brow powder. Eyeshadow is traditionally used to add color to the lids of the eyes. But it can also be use a eyeliner, blush, and so much more. Eyeshadow comes in pressed powder, and cream form. I also use eyeliner pencils and powdered blush as eyeshadow. The powder comes in a pan that is in a pot or a palette. The cream comes in a pot like concealer or in a crayon stick. Eyeliner is another thing everyone knows. It comes in more than just the classic pencil everyone knows. Eyeliner is used in many different ways. The way you apply your eyeliner can be just the way you like how it looks or you can apply it to make your eyes appear smaller or bigger. You can also tight line your eyes to make you lashes line look thicker and line your water line to add a pop of color or a bold line of black. Liner comes in liquid, a sort of cream, gel, and the classic pencil that is kind of like wet powder. You can also use eyeshadow for liner. The liquid comes in a pot, jar with a wand with a thin brush at the end, and in a “pencil” which is a pen with a sponge or brush on the end. The cream is a kohl liner. It feels like cream then dries so it doesn’t smudge. It comes in a pencil. The classic pencil is like wet shadow and is that pencil that kind of jumps and doesn’t go on quite right. The gel liner is kind of like the gel eyebrow filler. It comes in a pot like cream concealer and comes with an angled eyeliner brush. Everyone knows mascara too. It really on has one texture and one package. Every brand makes mascaras that do different things. The way the mascara is made is different but it all is pretty much the same thing. It may have a different effect on the lashes but it’s kind of the same thing. No matter what the brand says the mascara does there is something all mascara does. All mascara is meant to make your lashes darker and more noticeable. Other things a mascara does is specific to that mascara. No matter the different things mascara can do they all have the same base formula. Some are thinner than others. And some are thicker than others. All mascaras come in the same type of plastic tube that has a wand with a spoolie on the end. Different brands design the spoolies different for each mascara. Lip primer isn’t like face and eye primers. It’s is usually skin toned or white. Lip primer is used to even out the color of your lips and making the color of your lips lighter/all one color so you lip products are truer to their colors. It is also used to keep lip products from running out into the lines around your lips. It comes in a cream formulation. Lip primer comes in a crayon chubby stick. There a lot of different lip color products so we are going to do this one a little differently. No matter what lip product it is, all lip color products are meant to add color to your lips. Whether it be a light tint like lip gloss or a really pigment color like lip stick. Everyone knows lip stick. It’s the first lip color anyone buys. Lip stick only has one formulation. It’s a wax stick twist up thing. It comes in a stick twist up tube. Everyone knows lipstick tubes. Even if they are the square or weird shaped ones everyone knows a lipstick tube. Everyone knows lip gloss. It’s thin and lightly pigmented. It adds slight color to your lips and adds shine. All lip gloss has the same type of formula. It’s thin and shiny. Some are more pigmented than others. Though almost all lip gloss isn’t highly pigmented. Lip gloss comes in the classic plastic tube with a wand that has a sponge applicator on it and some gloss comes in a squeeze tube with a hole on the end. Lip lacquer is also known as liquid lipstick. It is like a thicker more pigmented lip gloss that dries to look like lip stick. It’s like a thick pigmented lip gloss, a liquid lip stick. Lip lacquer comes in a plastic tube with a wand that has a sponge on the end. I believe a few brands have lip brushes on theirs. Lip crayons/chubby sticks are the fat lip pencils. The lip crayons are usually a cream like formula. Like lip stick in a pencil or lip balm in pencil. A fat pencil that either twists up or is sharpened. Lip liner is a normal pencil that can be used as a color on its own or just on the outer line of your lips to keep lipstick from bleeding out in the lines around the lips. Lip liner can come in the classic liner like eye liner that feels like eyeshadow and it can come in a cream pencil. Lip liner comes in the classic sharpen pencil and a twist up pencil. Lip stain is a thin highly pigmented lip color that dries to have color on the lip while keeping them feeling like they don’t have any product on. Lip stain is like a thin, highly pigmented lip gloss that dries to just leave the color. And leaves the lips feeling as though there is no product on them. Lip stain comes in a plastic tube with a wand that either has a sponge or a lip brush on the end of it. I personally don’t use setting spray. But it is applied after all your makeup is done. It is meant to set all of the makeup in place and keep it from moving through-out the day. It is a liquid spray product. Well I think that’s everything. I hope this all made sense and that this post isn’t too long. It took a little longer to write than I thought it would. And it ended up longer then I thought it was going to be too. I hope this helped sort out all of the products for you. I may not be a vet at makeup but I think I know what all this stuff is for. 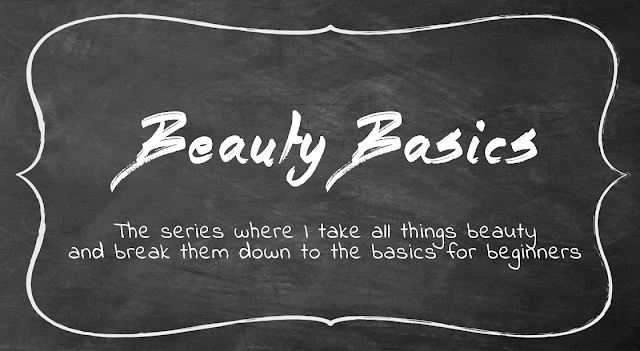 This is the third post in my Beauty Basics series. The first two are about Makeup Lingo, which you can read here, and Types of Makeup Packaging, which you can read here. I’m so happy to finally be uploading this post. It took a lot longer than I thought to write and I’m so happy to finally have it uploaded. I hope someone finds this helpful. Even if only one person finds this helpful it was worth it. Disclaimer: I AM NOT a professional makeup artist. You could say I am a self taught makeup artist as I have taught myself a lot though trial and error and playing with makeup. I have researched a lot of things on makeup over the past few years. I’m not claiming to know everything but I think I’ve got the basics down and want to make learning them easier for anyone just starting to get into makeup. I am not a newbie anymore but I’m not makeup vet either.
. Beauty, Beauty Basics, Makeup, What are these beauty things for?